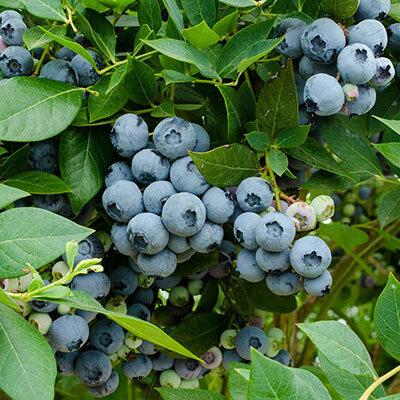 Legacy Jumbo Blueberry is a Northern Highbush variety that produces heavy, reliable yields that extend blueberry season well into the later part of summer. You'll harvest bushels of fruit that is tasty eaten fresh or used for preserves, baked goods or fresh desserts. Delicate white flowers give way to medium to large light blue berries with wonderful flavor and sweetness. Legacy is tolerant to heat and drought and is best planted in full sun. Prune out leggy small twigs for better berries. For each offer ordered, get 1 jumbo bareroot. Depth: Plant at same depth as it is in the nursery. Firm soil and water thoroughly. Foliage: Glossy green foliage transforms into brilliant shades of red and orange in the fall. Flower Form: Delicate white flowers. Fruit: Medium to large light blue berries with superior flavor and sweetness.